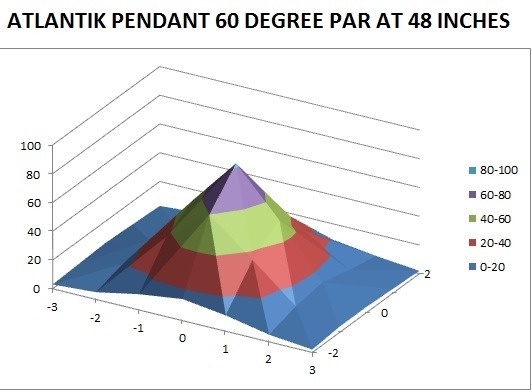 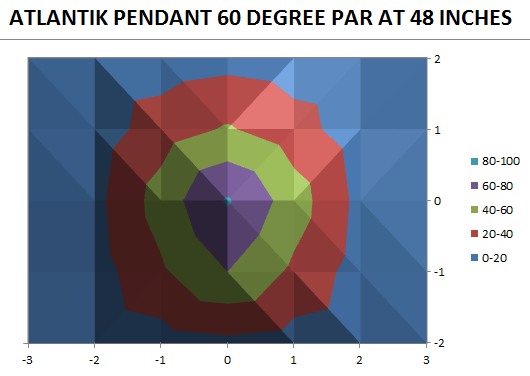 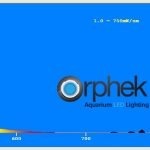 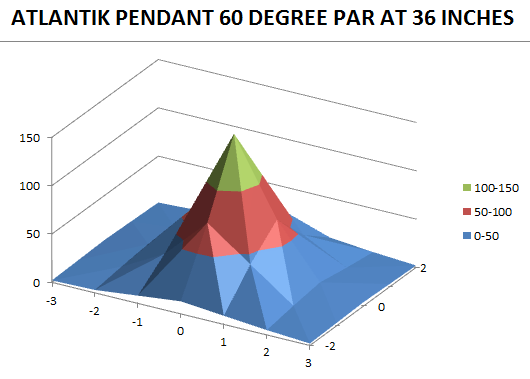 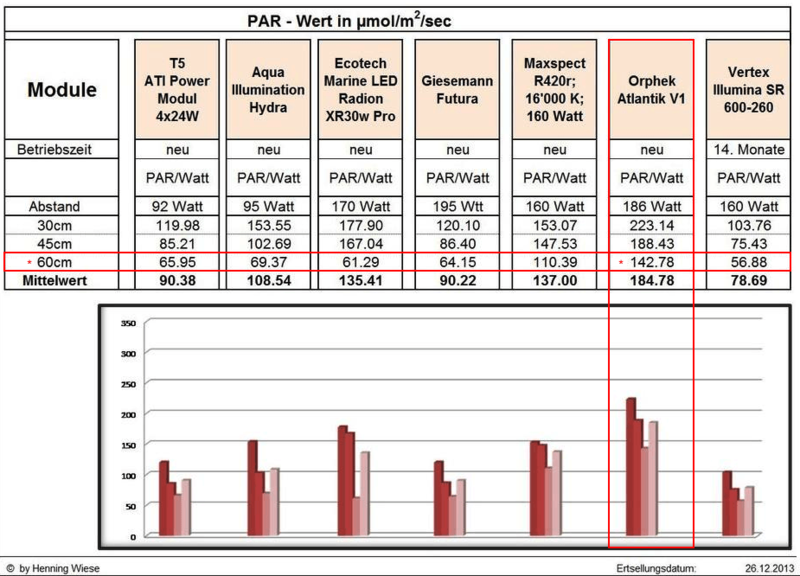 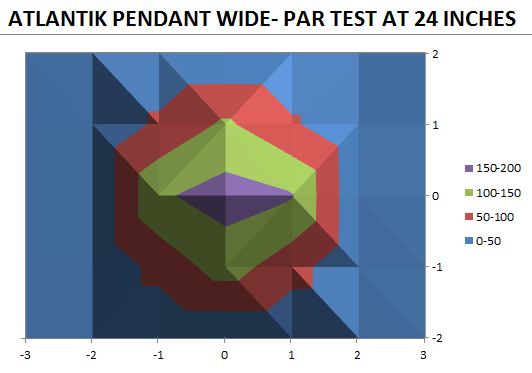 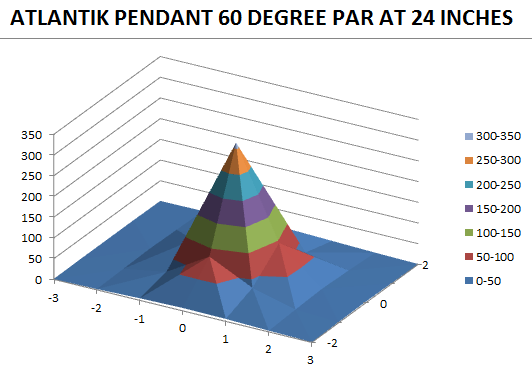 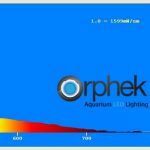 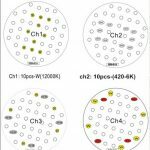 LED PAR test results of all Orphek LED Products including chromaticity charts can be found here. 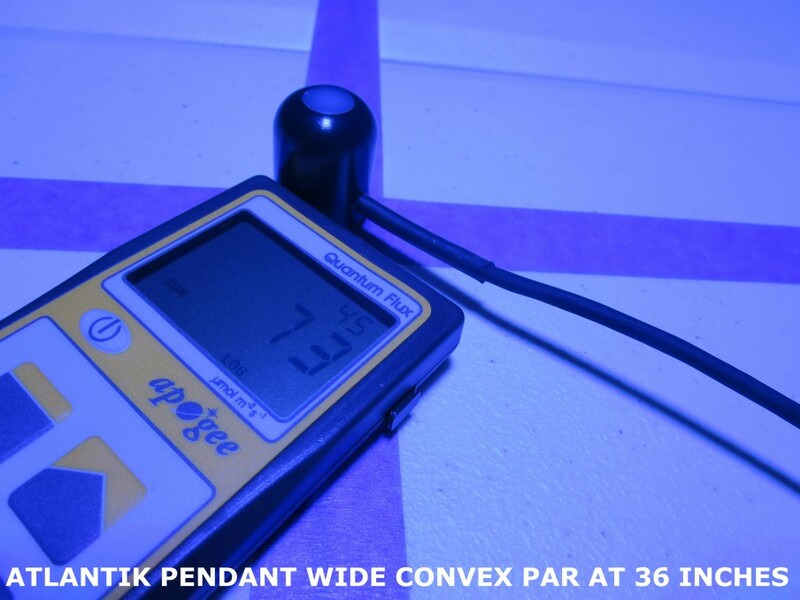 PAR is the abbreviation for Photosynthetic Active Radiation in the spectral range of 400 to 700 nano-meters. 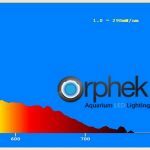 This is the range that is needed by plants and symbiotic Zooxanthellae algae which live in the tissues of corals, anemones, clams, and other photosynthetic life. 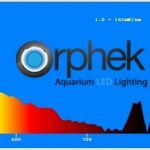 Orphek’s design team uses spectrographs generated by a spectrometer and most importantly, a CIE RGB color chromaticity chart. 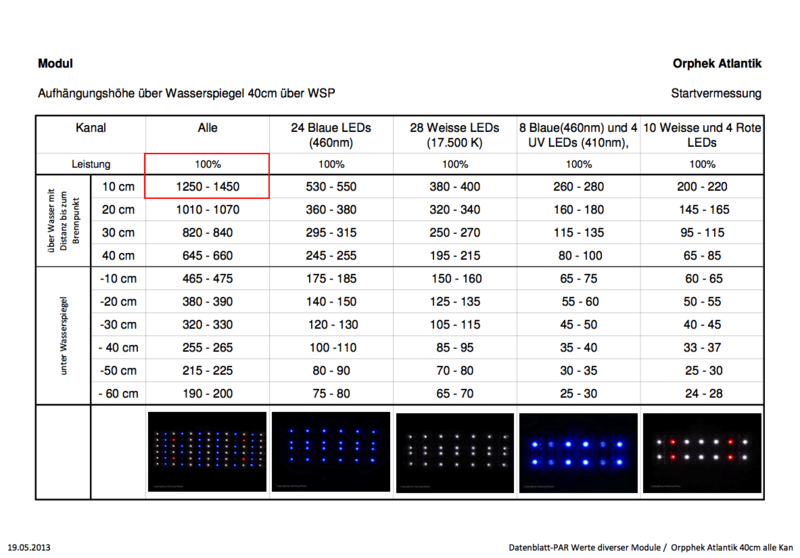 This chart maps a range of physically produced colors as well as the intensity of the colors. 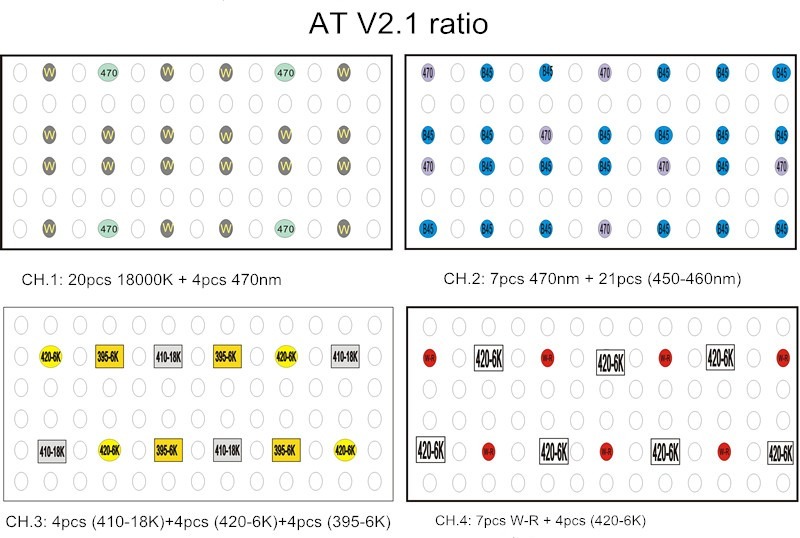 Without a chromaticity chart or map, a spectrograph alone is not useful. 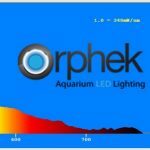 Orphek uses both for a meaningful report of their LEDs ability to produce light corals positively respond to. 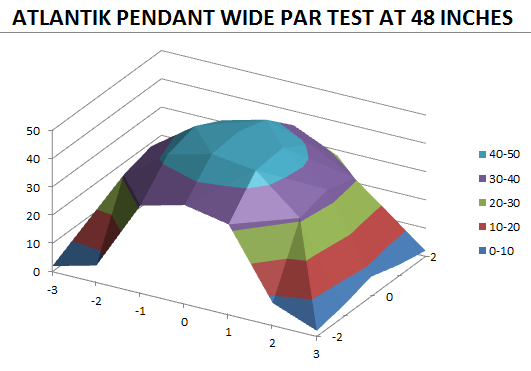 has been completed and the results are in. 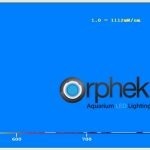 This is the most versatile LED aquarium light on the market. 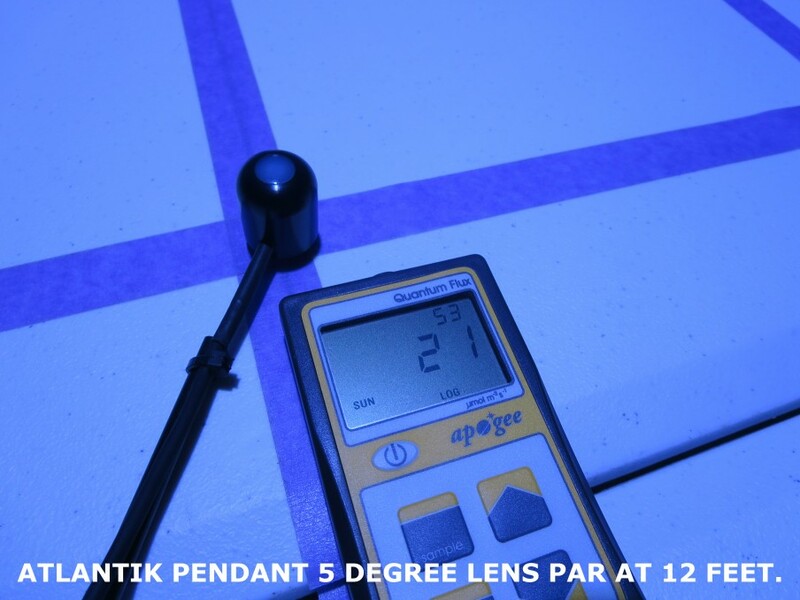 The Atlantik Pendants ability to cover tanks from shallow grow out systems to deep water reef tanks in excess of 10+ feet (3 meters) deep make it one of the best multi-purpose lights available to the aquarium industry professional. 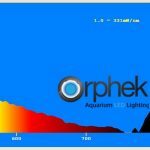 High quality components along with the Atlantik spectrum give it the edge over the competition by focusing on the needs of invertebrates and providing a specifically tuned spectral output. 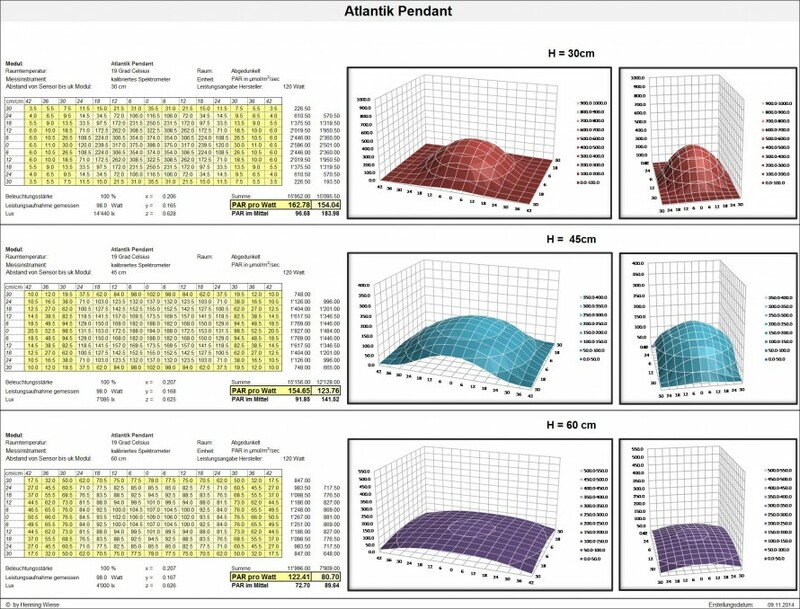 More info about Atlantik Spectrum. 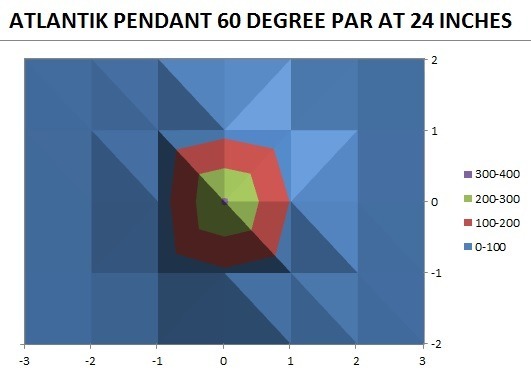 The Atlantik Pendant is available with many options allowing the light to be tailored for the environment in which it is used. 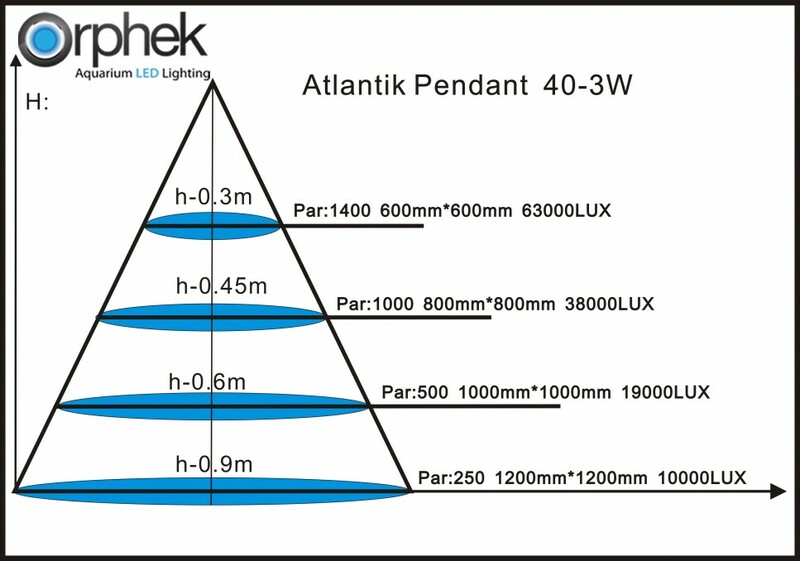 There is an Atlantik Pendant for Freshwater installations, Saltwater systems and Coral Farms. 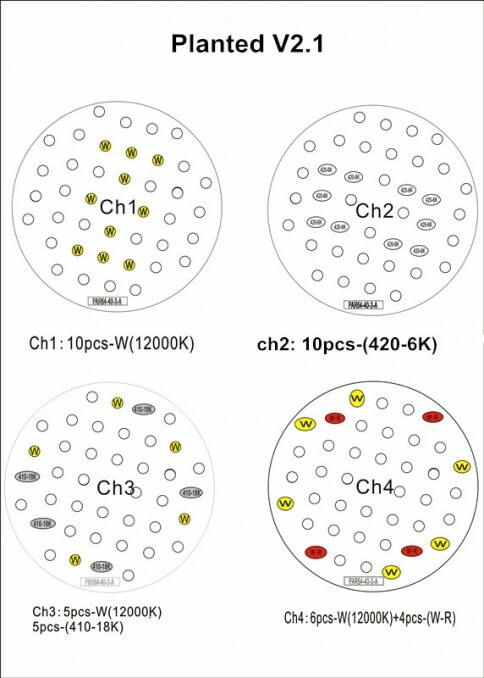 Each unit is available with or without WIFI control. 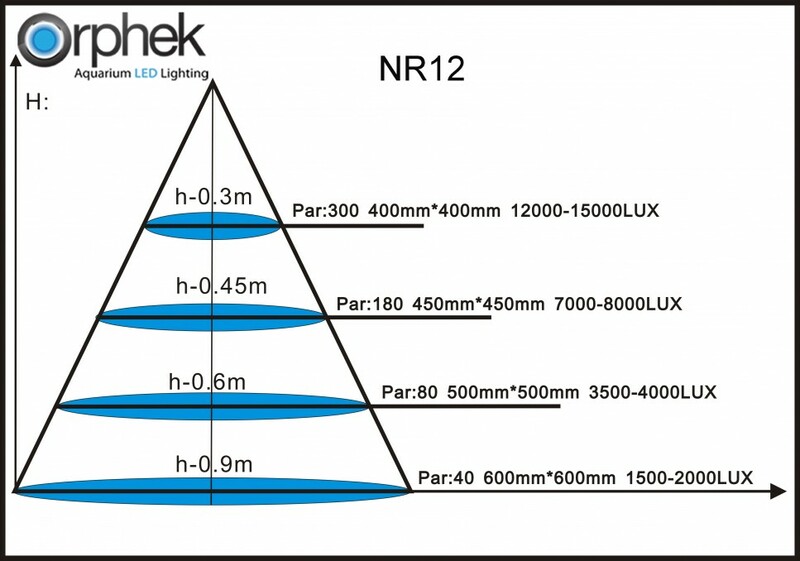 Non-WIFI units are also available with or without dimming capability. 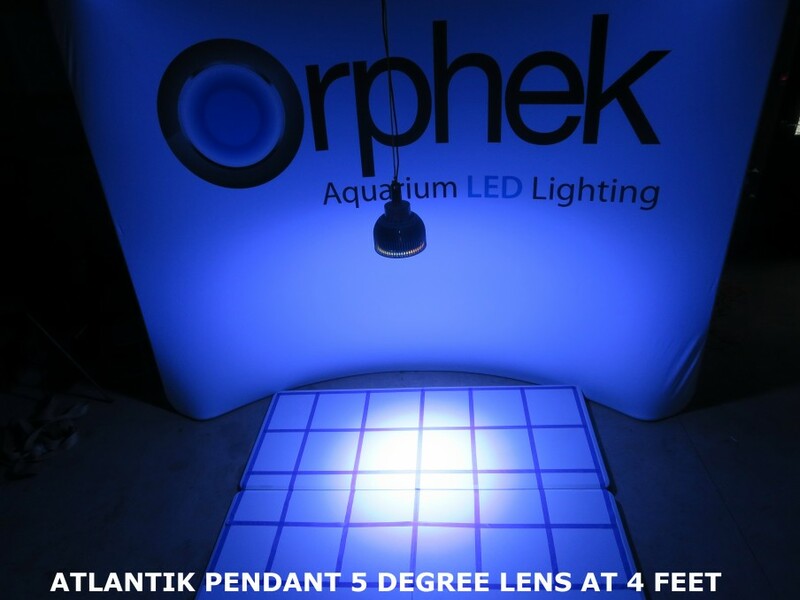 The Atlantik Pendant is able to cover a wide range of tanks utilizing multiple lens options ranging from five degrees for deeper tanks all the way up to our wide angle convex lens giving the most spread while maintaining high PAR numbers. 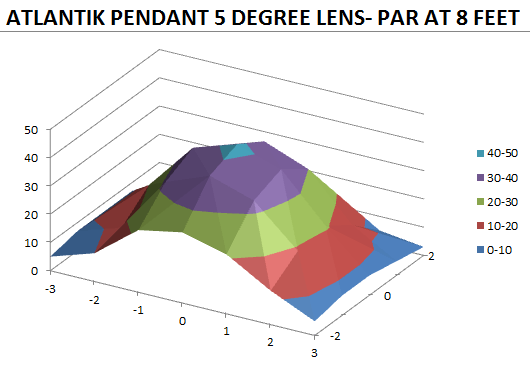 Lens options available are in degrees of 5, 7, 10, 15, 45, 60 and Wide Convex. 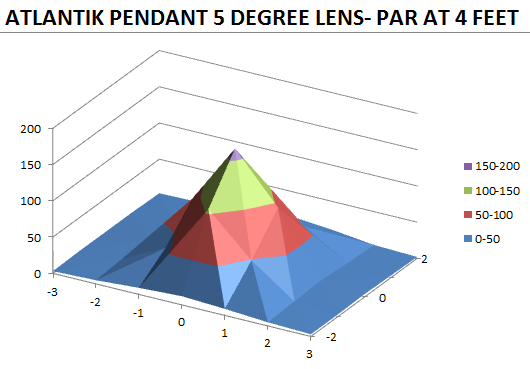 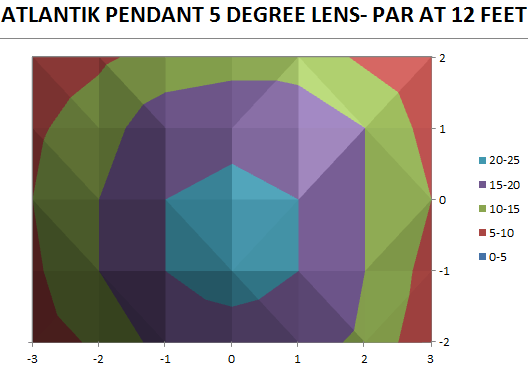 PAR numbers and coverage for the 3 most common lens options are available in the following sections. 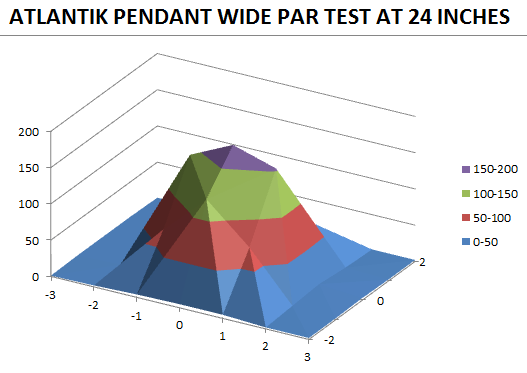 Each unit was tested over a 6 foot x 4 foot area at heights of 24 inches, 36 inches and 48 inches. 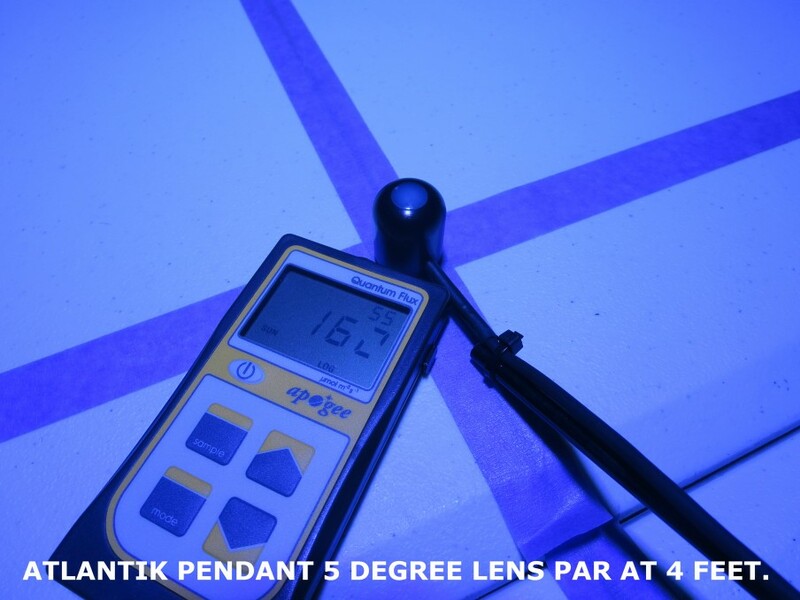 The 5 degree unit was tested at 4 feet, 8 feet and 12 foot heights. 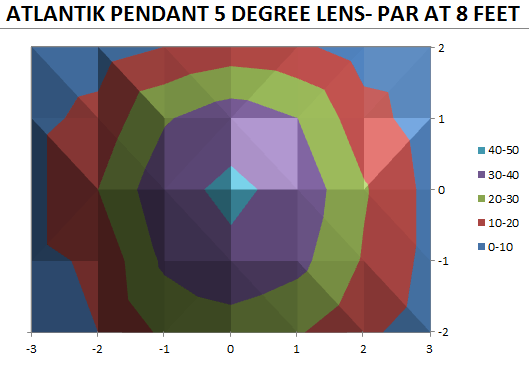 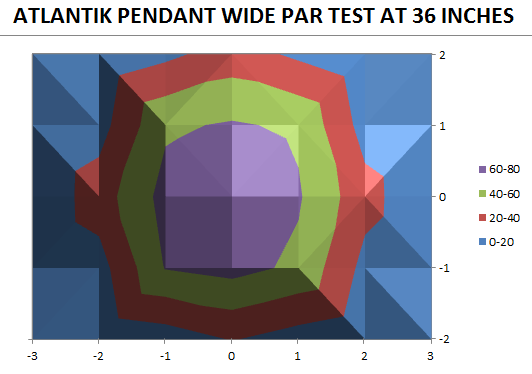 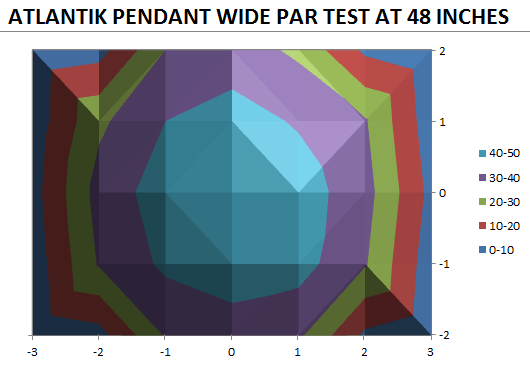 Atlantik Pendant- Wide Convex lens. 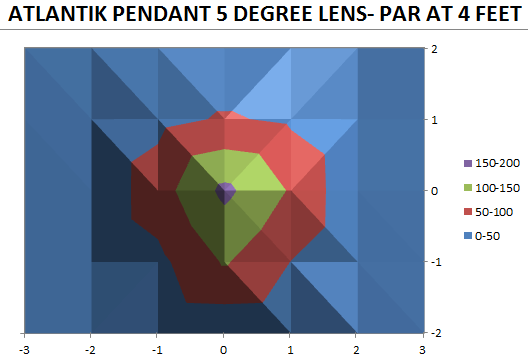 This is the most common lens option. 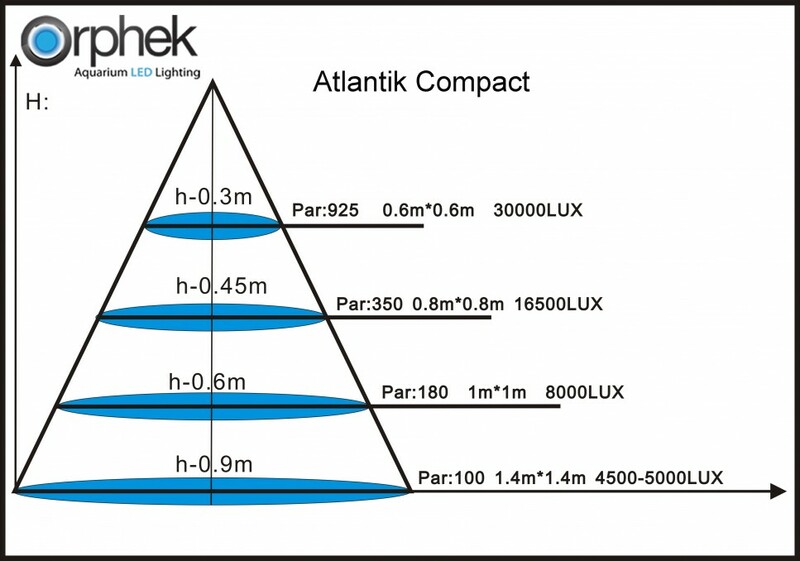 Utilizing the convex lens configuration of the original Atlantik series, these units give the best combination of spread and intensity. 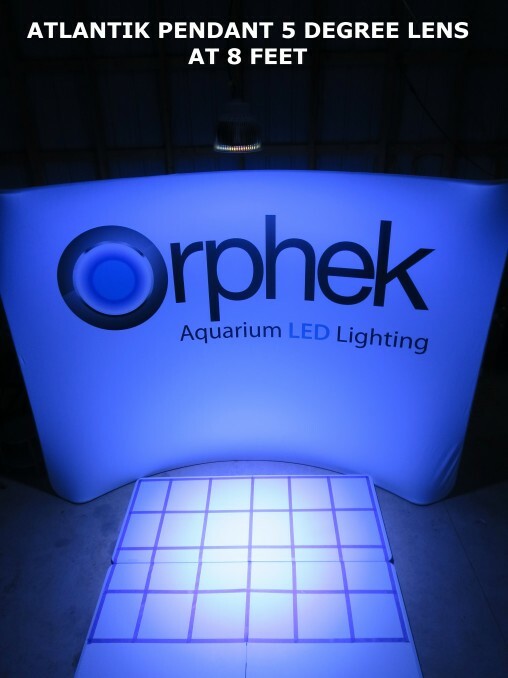 Best suited for tanks up to 30 inches deep and coral grow-out systems. Atlantik Pendant- 60 degree lens. 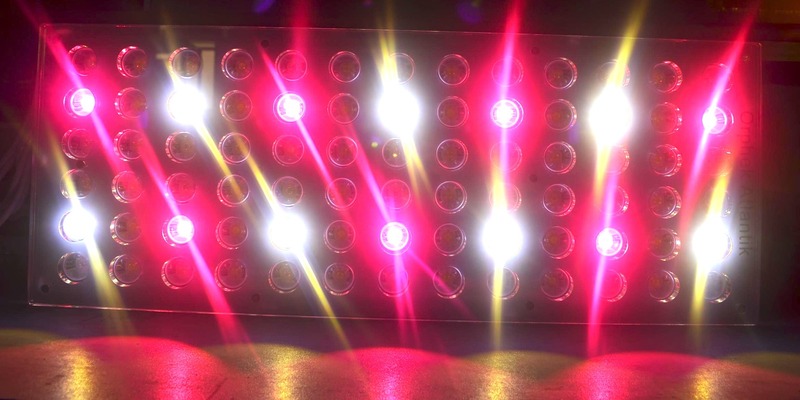 The 60 degree honeycomb lens offers a good mix of coverage and penetration allowing it to work with tank depths up to 36 inches. 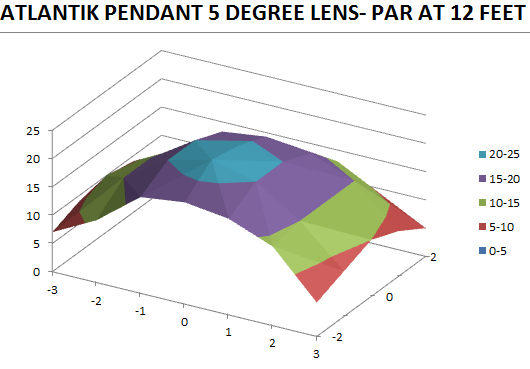 The honeycomb lenses provide a diffusion of light that helps to minimize sharp coverage lines. 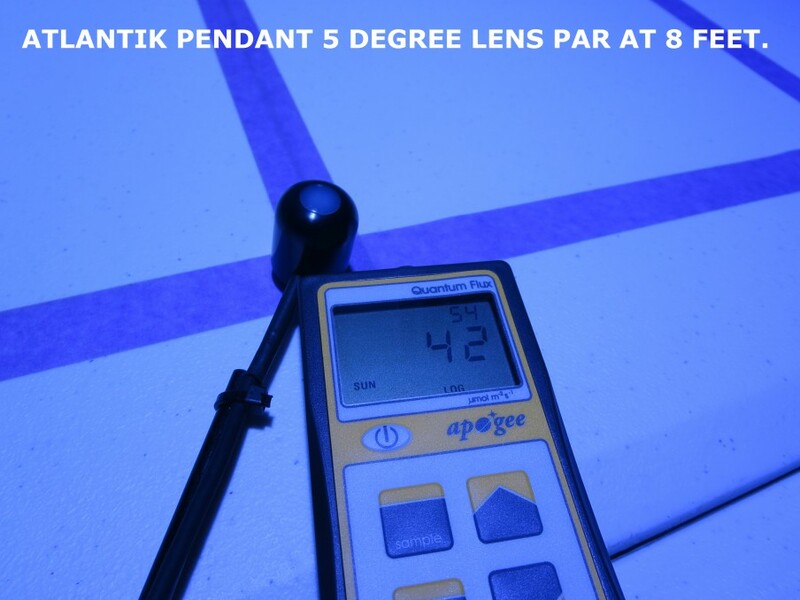 The 5 degree option provides deep water penetration allowing for coral species to be kept in excess of 10 feet (3 meters). 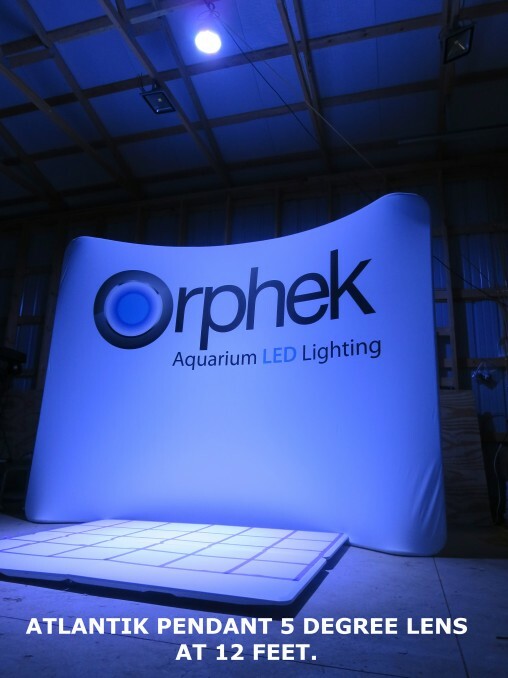 This unit combines the power of a flood light with the resources of the Atlantik spectrum. 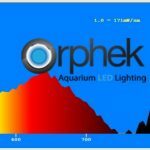 Since the majority of the spectrum is in the necessary PUR bands for invertebrates all of the available light is useable by your corals. 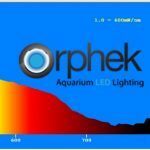 Orphek makes the most efficient lights on the market today , Orphek employs dual-chip technology to increase lumens and PAR per Watt as well as the production of chlorophyll A and B for coral growth and sustainability. 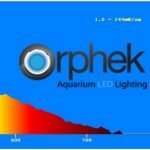 provides the highest quality and quantity of * Wide spectrum White UV/violet LED’s to ensure the longevity and beauty of tank inhabitants.